These highlights do not include all the information needed to use CYCLOPHOSPHAMIDE FOR INJECTION safely and effectively. See full prescribing information for CYCLOPHOSPHAMIDE FOR INJECTION. Cyclophosphamide for injection, although effective alone in susceptible malignancies, is more frequently used concurrently or sequentially with other antineoplastic drugs. 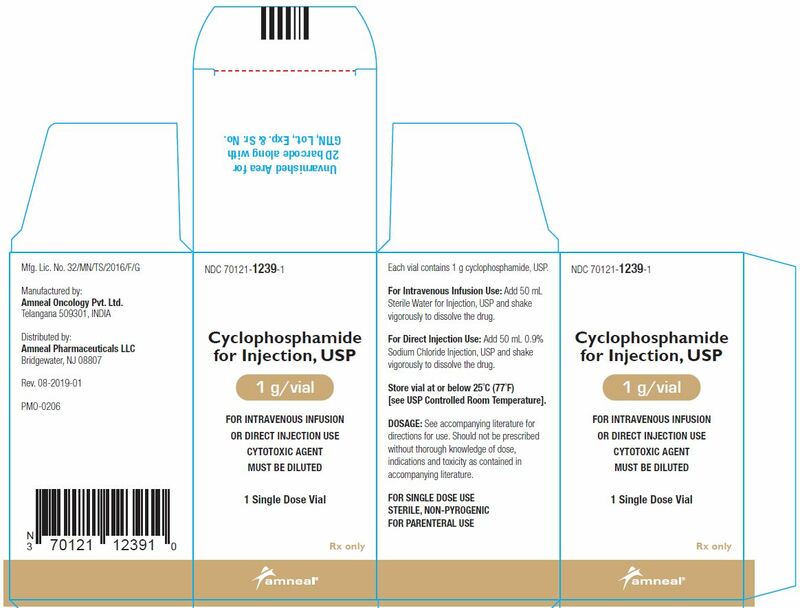 Cyclophosphamide for injection is indicated for the treatment of biopsy proven minimal change nephrotic syndrome in pediatrics patients who failed to adequately respond to or are unable to tolerate adrenocorticosteroid therapy. During or immediately after the administration, adequate amounts of fluid should be ingested or infused to force diuresis in order to reduce the risk of urinary tract toxicity. Therefore, cyclophosphamide for injection should be administered in the morning. When used as the only oncolytic drug therapy, the initial course of cyclophosphamide for injection for patients with no hematologic deficiency usually consists of 40 mg per kg to 50 mg per kg given intravenously in divided doses over a period of 2 to 5 days. Other intravenous regimens include 10 mg per kg to 15 mg per kg given every 7 to 10 days or 3 mg per kg to 5 mg per kg twice weekly. When cyclophosphamide for injection is included in combined cytotoxic regimens, it may be necessary to reduce the dose of cyclophosphamide for injection as well as that of the other drugs. Handle and dispose of cyclophosphamide for injection in a manner consistent with other cytotoxic drugs.1 Caution should be exercised when handling and preparing cyclophosphamide for injection. To minimize the risk of dermal exposure, always wear gloves when handling vials containing cyclophosphamide for injection. Parenteral drug products should be inspected visually for particulate matter and discoloration prior to administration, whenever solution and container permit. Do not use cyclophosphamide for injection vials if there are signs of melting. Melted cyclophosphamide for injection is a clear or yellowish viscous liquid usually found as a connected phase or in droplets in the affected vials. Cyclophosphamide for injection does not contain any antimicrobial preservative and thus care must be taken to assure the sterility of prepared solutions. Use aseptic technique. Reconstitute Cyclophosphamide for Injection with 0.9% Sodium Chloride Injection, USP only, using the volumes listed below in Table 1. Gently swirl the vial to dissolve the drug completely. Do not use Sterile Water for Injection, USP because it results in a hypotonic solution and should not be injected directly. Reconstitute Cyclophosphamide for Injection using 0.9% Sodium Chloride Injection, USP or Sterile Water for Injection, USP with the volume of diluent listed below in Table 2. Add the diluent to the vial and gently swirl to dissolve the drug completely. To reduce the likelihood of adverse reactions that appear to be administration rate-dependent (e.g., facial swelling, headache, nasal congestion, scalp burning), cyclophosphamide for injection should be injected or infused very slowly. Duration of the infusion also should be appropriate for the volume and type of carrier fluid to be infused. If not used immediately, for microbiological integrity, cyclophosphamide for injection solutions should be stored as described in Table 3.
a Storage time is the total time cyclophosphamide for injection is in solution including the time it is reconstituted in 0.9% Sterile Sodium Chloride Injection, USP or Sterile Water for Injection, USP. Liquid preparations of cyclophosphamide for oral administration may be prepared by dissolving cyclophosphamide for injection in Aromatic Elixir, National Formulary (NF). Such preparations should be stored under refrigeration in glass containers and used within 14 days. hyperuricemia in patients with rapidly growing tumors. Tamoxifen: Concomitant use of tamoxifen and chemotherapy may increase the risk of thromboembolic complications. Coumarins: Both increased and decreased warfarin effect have been reported in patients receiving warfarin and cyclophosphamide. depending upon the dialysis system being used. In patients requiring dialysis, use of a consistent interval between cyclophosphamide administration and dialysis should be considered. Serious consequences of overdosage include manifestations of dose dependent toxicities such as myelosuppression, urotoxicity, cardiotoxicity (including cardiac failure), veno-occlusive hepatic disease, and stomatitis [see Warnings and Precautions (5.1, 5.2, 5.3 and 5.6)]. Cyclophosphamide, USP is a white crystalline powder with the molecular formula C7H15Cl2N2O2P•H2O and a molecular weight of 279.1. Cyclophosphamide is soluble in water, saline, or ethanol. Cyclophosphamide for Injection, USP is a sterile white powder available as 500 mg, 1 g, and 2 g strength vials. 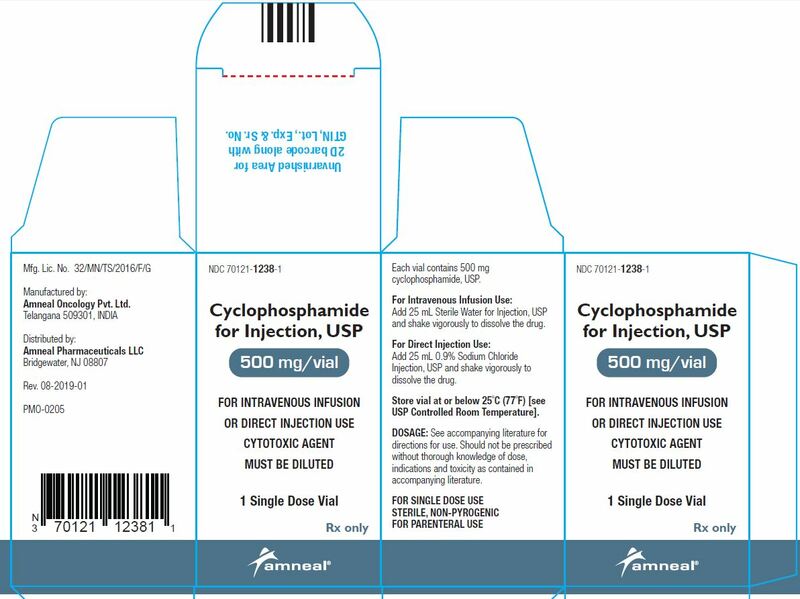 500 mg vial contains 534.5 mg cyclophosphamide monohydrate equivalent to 500 mg cyclophosphamide, USP. Following IV administration, elimination half-life (t1/2) ranges from 3 to 12 hours with total body clearance (CL) values of 4 to 5.6 L/h. Pharmacokinetics are linear over the dose range used clinically. When cyclophosphamide was administered at 4 g/m2 over a 90 minutes infusion, saturable elimination in parallel with first-order renal elimination describe the kinetics of the drug. The liver is the major site of cyclophosphamide activation. Approximately 75% of the administered dose of cyclophosphamide is activated by hepatic microsomal cytochrome P450s including CYP2A6, 2B6, 3A4, 3A5, 2C9, 2C18 and 2C19, with 2B6 displaying the highest 4-hydroxylase activity. Cyclophosphamide is activated to form 4-hydroxycyclophosphamide, which is in equilibrium with its ring-open tautomer aldophosphamide. 4-hydroxycyclophosphamide and aldophosphamide can undergo oxidation by aldehyde dehydrogenases to form the inactive metabolites 4-ketocyclophosphamide and carboxyphosphamide, respectively. Aldophosphamide can undergo β-elimination to form active metabolites phosphoramide mustard and acrolein. This spontaneous conversion can be catalyzed by albumin and other proteins. Less than 5% of cyclophosphamide may be directly detoxified by side chain oxidation, leading to the formation of inactive metabolites 2-dechloroethylcyclophosphamide. At high doses, the fraction of parent compound cleared by 4-hydroxylation is reduced resulting in non-linear elimination of cyclophosphamide in patients. Cyclophosphamide appears to induce its own metabolism. Auto-induction results in an increase in the total clearance, increased formation of 4-hydroxyl metabolites and shortened t1/2 values following repeated administration at 12- to 24-hour interval. renally impaired patients. The results demonstrated that the systemic exposure to cyclophosphamide increased as the renal function decreased. Mean dose-corrected AUC increased by 38% in the moderate renal group, (Creatinine clearance (CrCl of 25 to 50 mL/min), by 64% in the severe renal group (CrCl of 10 to 24 mL/min) and by 23% in the hemodialysis group (CrCl of < 10 mL/min) compared to the control group. The increase in exposure was significant in the severe group (p>0.05); thus, patients with severe renal impairment should be closely monitored for toxicity [see Use in Specific Populations (8.7)]. Total body clearance (CL) of cyclophosphamide is decreased by 40% in patients with severe hepatic impairment and elimination half-life (t1/2) is prolonged by 64%. Mean CL and t1/2 were 45 ± 8.6 L/kg and 12.5 ± 1.0 hours respectively, in patients with severe hepatic impairment and 63 ± 7.6 L/kg and 7.6 ± 1.4 hours respectively in the control group [see Use in Specific Populations (8.8)].